Forget about kids and teens, how to do cats feel about watching other felines online? 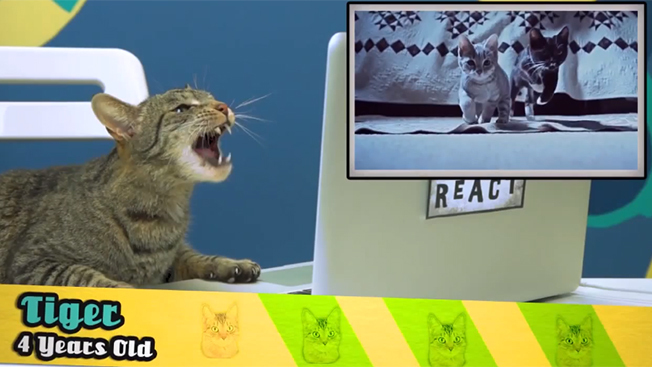 In a bit of branded self-satire, YouTube megaproducers The Fine Bros. partnered with Friskies to create Cats React to Viral Videos, an April Fools' version of their highly popular Kids React, YouTubers React and Elders React Web series. But, instead of naive kids and teens talking about pop culture events, the duo interviewed kittens, cats and some fellow YouTube stars in cat costumes about famous cat videos. "The Friskies team has been a great collaborative partner," Benny and Rafi Fine tell AdFreak in an email. "Our fans have always been asking us to make a spinoff of our popular React franchise, but with cats instead." The Fine Bros. have a history of working with brands, so the spoof didn’t feel unnatural. "The Fine Bros are some of the top video creators in the world today and have never integrated a brand partner into their 'React' franchise before. With a video like ‘Cats React,’ however, it felt like the perfect opportunity for Friskies and the Fine Brothers to collaborate,” Shaun Belongie, senior brand manager for Friskies, said in an email. The product that Friskies is trying to promote, Friskies SauceSations, isn't featured heavily in the video. It only appears in a few small scenes and in the title card at the end of the video. Reach Entertainment's head of digital, Marc Hustvedt, whose agency produced the ad, explained that in order for a video to go viral, it needs to feel organic. Brand sponsors can't litter the ad with their logos, or people will be turned off and won't feel the need to share it.